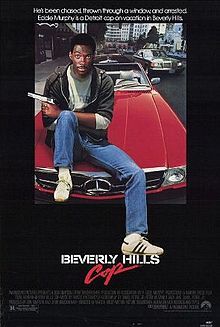 A long long time ago we reported that there was a Beverly Hills Cop TV series in the works. I hadn't heard anything about it in ages so I thought it was dead. Until yesterday when it was announced that Brandon T. Jackson (who played Alpa Chino in the film Tropic Thunder) was signed to play the lead role in the upcoming TV series. Brandon will play Aaron Foley, Axel's son, who was born and raised in Detroit but moves out to California to fight crime in Beverly Hills. Eddie Murphy is slightly involved in this and will reprise his role of Aaron's dad Axel in at least the pilot. On the one hand, I think Jackson is a terribly funny guy. On the other hand, do "son of" movies/tv shows ever succeed? And will the "Axel F" theme be tweaked for the next generation? But mostly, I say no Judge Reinhold, no show. Would you tune in to watch Beverly Hills Cop, the PG-rated TV show?